Posted on February 22, 2018 , in Hot Tubs. How long it can take to heat your hot tub can depend on a number of factors. These can include how powerful your heating element is, the outside temperature, and if you keep a cover on your hot tub. To learn more about the length of time it will take to heat a hot tub as well as tips for how you can make heating your hot tub more efficient, keep reading below. How Long to Heat a Hot Tub? Hot tubs hold a lot of water, which can take hours to heat to your desired temperature. Generally, with a hot tub that is in good working condition, the water temperature will raise between 3-6 degrees each hour. To facilitate a quicker process, always leave your cover on your hot tub while heating to prevent heat from escaping from the water surface. The overall condition of your hot tub also plays a part in how quickly the water will heat. Components such as the pump, cover, jets and water heater all can affect how quickly your hot tub will reach its target temperature. In circumstances where some of your components may be worn or damaged, it can take substantially longer to properly heat your hot tub. For outdoor hot tubs, the external temperature also plays a role. The warmer it is, the quicker your hot tub will heat up. For the water to reach 100 degrees in your hot tub and it is a warm, sunny day, you can expect this to take approximately 4 hours. A common question that many hot tub owners will ask is whether or not they should leave their hot tub running 24/7 or turn off and only heat when planning on using it. There is no one size fits all answer, this depends on your lifestyle as well as the climate that you live in. Especially if you live in a cooler climate and want to use your hot tub throughout the winter months, you should leave it running to prevent pipes freezing or other damage. If you and your family frequently use your hot tub, it also makes more sense to leave it running so it can be enjoyed at a moment’s notice. On the other hand, if you tend to only occasionally use your hot tub it can make more sense to turn it off and only heat the water when you want to use it – although you will need to plan ahead to allow for enough time for the temperature to reach the proper level. Plus, this can save you money on your energy costs compared to leaving your hot tub running 24/7. There are a few tips to be aware of that can help speed up heating your hot tub as well as reduce costs on your energy bill. To start, invest in a quality, lockable cover with tapered edges that will trap and reuse heat from inside the hot tub. Always leave the cover on when not in use and when you are heating the water. Your landscaping can also help with heating your hot tub. Having trees or shrubs that surround the hot tub help reduce the pull of heat away from the water. More elaborate landscaping such as a gazebo, enclosure or windshield can also help prevent cooler air from reaching the water. Finally, always make sure to stay on top of routine servicing and maintenance of your hot tub. This will ensure that all components are in good working order, allowing your water to heat as quickly as possible. 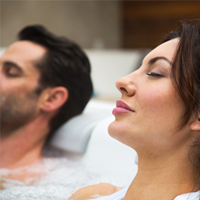 For more information on the many energy efficient hot tub models we carry, click here to download a hot tub buyers guide.